Most interesting fact: Is a re-appearing extra in Game of Thrones (alongside his horse). He (James, not his horse) also worked in a circus for 6 months! James grew up in Armagh in Northern Ireland on his family farm training horses, and went to school in the mountains of Newtownhamilton (we know - it sounds like the things childhood dreams are made of!) James made the move to Bristol eight years ago and joined us in the December of 2010 (like a wonderful Irish Christmas present). 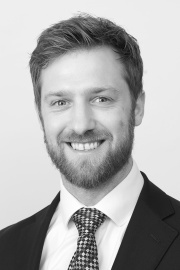 James has worked hard, acquiring exemplary knowledge of the Bristol market and has thus earned himself a place as one of our apartment specialists, making him a vital member of our team. His Irish charm and genial character are all to James’ credit and are key components to his success. He also has more hobbies than any other person and tries to cram mountain biking, surfing, snowboarding and horse-riding (among other outdoor pursuits) into his spare time. James also loves a good box-set and always knows the latest and best things to watch of an evening - our in-house Netflix guru!